Aylesbury Granulation Services regularly buy plastic waste suitable for recycling (such as HDPE, PP, ABS, polycarbonate), so if you have waste plastic to sell, then please get in touch. In the first instance it will help if you could drop us an e-mail with photos of your plastic waste and let us know the approximate weight and location of your plastic waste. Aylesbury Granulation Services specialise in the recycling of segregated rigid plastic waste. Whilst there are a range of materials that we process of a regular basis, we are always happy to look at new materials in order to try to deviate plastic waste away from landfill. In order for us to buy your plastic waste you need to know whether your material is suitable for recycling, in order for you to sell it to us. The key is that the material needs to be single stream and free of contamination. Here is some further information to help you with the plastic waste that you have to sell. All plastic products “should” have the recycling code embossed on to them as part of their manufacturing process. This does not always happen and we will always try to help where possible, please contact us for more help and advice. High density polyethylene is one of the world’s most popular products and it is the material which we buy the most of. It is very versatile in terms of products that can be made from it, but it is also easy to recycle. Some examples of HDPE plastic waste streams that we buy and recycle include wheelie bins, crates, drum, barrels and utility pipe. Polypropylene is another widely used polymer. It is chemical and fatigue resistant and has good elasticity and toughness properties. Some examples of PP plastic waste streams that we buy and recycle include buckets, grandstand seating, crates and pots. 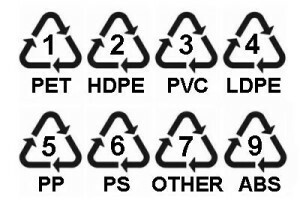 Unfortunately code 7 was derived for a whole range of plastics, and historically materials that were difficult to recycle were placed into the category. Over time there have been a number of advances in recycling and many of these materials can now be recycled. The plastic that we buy from this group is polycarbonate. PC is a very strong material and has the capability to be as clear as glass. It can also be found in a range of colours. Some examples of polycarbonate plastic waste streams that we buy and recycle include trays, bottles from water cooler machines, manufacturing waste and very high quality roofing. Acrylonitrile butadiene styrene is a very strong material which is impact resistant. It is light weight and can be injection moulded and extruded. It is the material from which Lego is made. Some examples of ABS plastic waste streams that we buy and recycle include transportation reels, bins and machine bodies.